We go further together. Learn the art and science of teaching AcroYoga and feel the transformative power of our unique Co-Teaching Philosophy. At an AYI Teacher Training you will get everything you need to jumpstart your AcroYoga teaching career, including professional partnerships and friendships that last a lifetime. When you step into an AYI Teacher Training, we ensure that you have the strongest foundation from which to grow your teaching and your practice. Our progressive methodology creates an accessible, fun path for students to achieve challenging goals. You will also learn skills that will help you create income and community through yoga, acrobatics, bodywork, fitness and festivals. We are over 1,000 Teachers in 60+ countries. 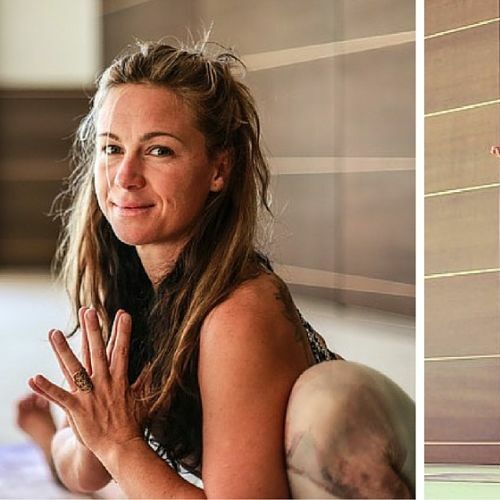 That’s a world-wide crew of high-level practitioners that have chosen this transformative path, making positive change through movement, connection, and play everyday. Get ready to meet the amazing humans who will continue to lift you up on this path. Our team of highly qualified instructors builds upon decades of experience to support the refinement of your practice, as a student and as a Teacher. AcroYoga has flipped my perspective and opened me up to expansive new perspectives. Becoming an AcroYoga Teacher has given me a great sense of belonging to something bigger, a network of radiant and inspiring people who are bringing joy, laughter, connection and empowerment through movement and play. After 10 years I look back at uncountable of moments bringing powerful transformation to such a big, colorful crowd of people who in return have enriched my own life experience. I couldn’t have chosen a more satisfying path than that of an AcroYoga Teacher. Laura, Oliver, and Mimi planted seeds of knowledge during the training I will be processing for months and sharing for a lifetime. Learning to co-teach was an amazing experience and invaluable challenge. I got to build relationships with incredible people from all over the world during the training. I know I will be seeing these faces again and activating these connections for life. Super inspiring, kind and supportive team of teachers. Each teacher brought their own strengths and qualities - they complemented each other. It felt like a safe space to be open, vulnerable, to explore and refine my practice and teaching. 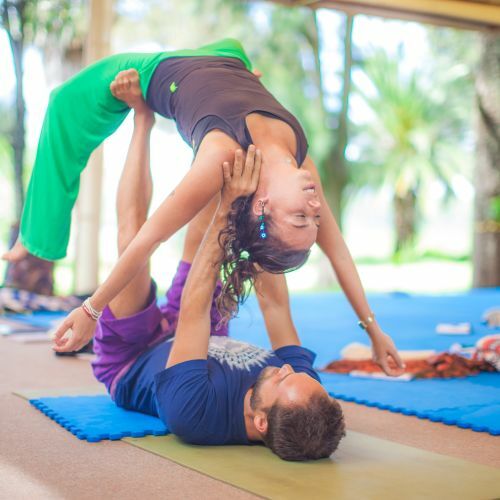 What makes the AcroYoga International Teacher Training special? We pride ourselves on the quality of our curriculum: the seamless integration of high-level acrobatics with flying therapeutics and Thai massage, the progressive development of skills to create strong foundations, and the transformative power of our co-teaching philosophy. Complete at least two, preferably three, AcroYoga International Immersions (Elemental required, second is your choice, Solar or Lunar). If you haven’t completed two Immersions, we can work together to review your training experience and verify that you can embody the skills covered at these two Immersions (this verification includes pre-training with our online educational materials, submitting videos of your skills, successfully completing an online quiz, and obtaining excellent recommendations from teachers you have worked closely with). You have shared AcroYoga with someone...anyone! We want to know that you have least tried to teach AcroYoga to someone in any setting. This doesn't mean in a studio class, but simply to a friend or family member at home, at a park... anywhere! Not quite there yet? Consider deepening your practice. Start with the Elements of AcroYoga Manual and the AYI Foundation Immersion. Coupling these experiences with practice, and studying the Solar, Lunar, and Elemental aspects of the practice through our educational materials will prepare you best. Our Teacher Trainings are for all people who want to learn the AcroYoga curriculum to deepen their practice and ready themselves to teach AcroYoga effectively, safely, eloquently and creatively. In other words, Teacher Trainings focus on preparing you to teach AcroYoga. This Training is not intended to build your advanced personal practice, but to ensure you can communicate the foundations of the practice clearly and consistently to your students. What if I don’t plan to teach? Even if you don’t plan on teaching, you can still benefit from the Teacher Training experience. You will deepen your practice in new ways and inevitably be moved by this transformational journey and the people you meet. What if I can’t attend the whole Training? AcroYoga International encourages work-life balance. If you can't get away from home for the whole Training and certification, no problem! Our Training is setup in a modular format to give you more flexibility. You can attend the first module, and complete the second module at another time in the future at any other one of our global modular trainings. You will build community across the globe, while balancing your life at home. What is the difference between a “residential” and “non-residential” Training? Non-residential Trainings do not include accommodation. Each student is responsible for selecting and booking their own accommodation, which gives you more flexibility and allows us to make the Training available at a lower price. Our students stay at Airbnbs, hotels, hostels, or with friends/relatives. Once you are accepted, we will support you through a private Facebook group so you can meet and arrange accommodation with your future flight partners and teaching colleagues. The price of the Training varies by location and format (residential vs. non-residential). If you know you want to join a Training, we encourage you to sign up early so you can take advantage of the “early bird” price. We also offer payment plans (with as little as US$500 deposit). We are committed to supporting all people and offer need-based scholarships for qualifying students. Once you are accepted, our Lead Teachers will share all the options with you. What is the application process like? Applying is free, and only complete applications will be considered. After acceptance, you will be asked to make a non-refundable deposit to hold your spot at the Training, and the remainder is due by the beginning of the Training. AYI Teacher Trainings fill fast, so make sure to register as soon as possible. If you have questions about whether or not you have the experience, please email us. What language are the Trainings taught in? Most of our Trainings are taught in English, with the exception of: Brazil, which is taught in English, Spanish, and Portuguese; and Mexico, which is taught in English and Spanish, and France will be taught in French. *And we don’t mean the wifi kind. Get updates on classes, events, free Acro tutorials and more.